Home ParentingPregnancy	To Everything There Is A Season…. 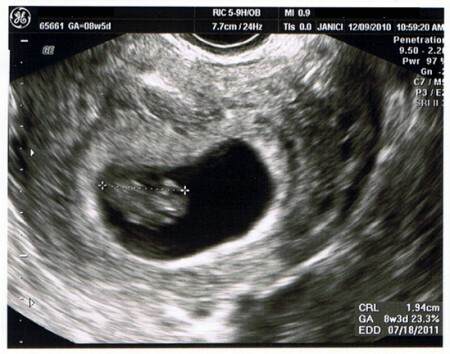 This past summer, when I went to the OB for my 9 week ultrasound, I went in with a certain knowing. An ominous feeling that I just couldn’t shake. Things didn’t feel right. I didn’t feel right. Yet, when we sat there staring at the stillness that was our miscarriage I was shocked. I didn’t want to be right. Your thoughts of love and support were so unbelievably welcome and appreciated and I will never forget the day the world walked with me through my darkest moments. So again, I thank you. I don’t understand miscarriage. I don’t know why it happens sometimes and not others. I do know that there really isn’t anything you can do to cause it. And I never understood the devastation of early miscarriage until I experienced it. There are no words. Just a season of mourning. This week, I would have been 28 weeks into that pregnancy. Instead, I am 9 weeks into a new one. We heard the heart beat today. We saw our little one wiggling and thriving and being perfectly developed for this stage. It’s been a roller coaster of emotion and questions and learning to trust. A faith walk like I have never experienced. I don’t know why things happen the way they do. But we are so thankful. This right here is a season to rejoice! woo hoo!! mazel tov. may you have a very easy, uneventful pregnancy and delivery. what a wonderful holiday joy this must be!! How well I remember that season in our own lives last year…both the joy of seeing precious Lily Mae in that early ultrasound and yet pieces of us still mourning the losses of the previous months. When my due dates for those miscarriages rolled around, we both felt the tug of the losses. And even my rejoicing in the life of our daughter cannot erase the scars of the ones who did not live. Yet, there is healing and hope in the child in my arms. Praying that for you all as well. Many, many blessings to you all! CONGRATULATIONS! I remember that fear. I lost a baby at 11 weeks. went into an ultrasound to see the missing heartbeat. Then we lost another one a couple months later. We were told to wait. But just 3 weeks after getting out of the hospital, I conceived again. Now she is a crazy 2 year old that makes my heart soar. Praying for you! Oh Andrea!!! I have tears in my eyes!!!!! I am so so so so so so happy for you!!! I will keep you guys in my prayers. I know this was meant to be!! Girl, I SO totally almost tweeted at you yesterday re: the magazine at the Dr. I was going to ask if you had something to tell us, but did not want to accidentally out you! Also thought U ere going to tweet an U/S pic, so maybe I am psychic? Hooray! What a beautiful Christmas present for all of you! What a roller coaster ride you’ve been on this year. And what a blessing to hear your little one’s heartbeat. Aww…..YAY!!! Congratulations to you!!! Prayers for a healthy, easy, happy, full term pregnancy!!! Hugs!!! Yay! Yay! Yay! Congratulations to you all and happy gestating to you! Losing a pregnancy is a pain like no other. The love we can form over something so small is immense. Hugs and cheers to a healthy heartbeat! Congratulations!! It’s hard to know and understand why things happen the way they do. Despite the sadnesses, there are great reasons to be thankful. You summed it up best in the title .. truly, a season for everything. Woohoo! So glad the cat is out of the bag and all looks well. You have been in my thoughts and prayers. I KNEW you were pregnant when I saw your pic from the docs office…of the magazine…don’t know why…but something in me said you are pregnant!!! awww! I got chills and tears! I am so happy for you and praying blessings and protection on you and your family. Peace on you. Congratulations!! I’m so excited for you guys!! Congratulations!! I remember how brave you were at BlogHer! I am excited for your Baby Season! Congratulations! I am so thrilled for you! That is so great, Andrea! Congratulations to all three Updykes on this great news. Thank you so much Jean! We are so excited and can’t wait to see what 2011 will bring! I am so behind on my blog reading! I was thrilled to come here and read this. Congratulations, Andrea!!! We too lost a baby this past summer..July 18th. It was hard, it was heartbreaking. We are blessed to be expecting another baby anyday. We still miss our angel baby and think of him/her often but are excited we are able to bring another one into the world soon. Best of luck to you!